Sell your books for cash. We pay for the shipping! How do I ship you my books? If I have questions, who do I contact? Will you accept my books in any condition? Do you buy back Course Manuals? What happens if I send materials with no buyback value? I have a few extra books that are not on my buyback quote. Can I send them to you in case you need or want them? Do I need to send you the original CD that came with my textbook? My buyback quote includes the package I ordered and one of the items contained in the package is listed separately. Will I receive payment for each item? How do you determine buyback values? What is an ISBN number? Where do I find a book's ISBN number? What paperwork do I need to include in my package? Do I have to pay for shipping? Can I use a shipping method other than a pre-paid label? When will I receive my check? Who can sell their books through your Buyback Program? Step One: Pack your textbooks in a strong, sturdy box suitable for shipping. Fill the empty spaces with a clean filler. Remember, the received condition determines the final value of your shipment. Be sure you have packaged your shipment well to protect your investment. Step Two: Please print and enclose your packing list. If you do not include the packing list with your books, you may not be credited for the buyback. Keep a copy for yourself. Tape the box securely using appropriate shipping or box tape. Step Three: Once you complete your quote you will receive an email with a link to your pre-paid UPS Shipping Label. Please print the label and follow the instructions regarding mailing your package. Securely attach the label to the top of the box. Make sure there is only one mailing label on the box you are using. Then, ship us your books. Note that the postage paid UPS label does not insure your package. Should you desire to insure your package, we suggest you purchase those services from UPS at your expense. We are not responsible for lost, stolen or damaged books. You will not receive payment for books that do not meet our minimum standards of quality. If you are unsure of whether or not your book is acceptable, simply ask yourself if you would be satisfied if we sold it back to you. No. Course manuals, working papers, and reprints have no buyback value. Do not send items of no value. Books submitted to us for buyback that do not meet our minimum standards of quality will either be discarded or returned to you at your expense. If there is no value on your items, you will receive notification in the form of a letter or email. You have 1 week to request to have the materials returned to you. Please note that books of no value are grouped together and we cannot guarantee that you will receive the exact book you submitted. The returned book will however be the same title and edition. No. Any items that are received with a buyback quote and are not listed can cause delay in processing. These unlisted items will be discarded. Although we prefer to receive the software that originally came with your textbook, it is often not required. Our system has different prices for books with and without software. Please refer to your buyback quote for details. If the item listed has "w/CD", "w/Study Guide", "w/Companion", etc., please include the supplemental materials in your shipment. We often buy back books either as the text only or as a package. We list both items on your buyback quote to give you an opportunity to sell back just the text in case you have discarded or used the supplemental items that the package originally included. The price paid is for either the textbook by itself OR the package. Buyback values are based on anticipated future demand for a book and current stock level. Since the bookstore is partnering with MBS Textbook Exchange we are able to buy back more books since the demand is based on thousands of colleges and universities throughout the nation. ISBN stands for International Standard Book Number. It is a unique identification number assigned to every book sold anywhere in the world. 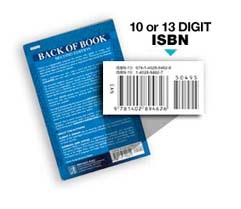 The ISBN allows a title to be located quickly and accurately, wherever it is sold. Be sure to include a copy of your packing list with every shipment. If you are sending multiple boxes, please place a copy of the packing list in each box. We are not able to provide payment for shipments that lack all required paperwork. No! When you sell your books through this site we provide you with a pre-paid UPS shipping label that you will receive via email after you generate a quote. When you receive the email containing the link to your packing list, be sure to click the link to your complimentary shipping label. Print the UPS label and affix it to the package containing your books and then simply drop your package off at the nearest UPS shipping location. Please Note: The postage paid UPS label does not insure your package. We are not responsible for lost, stolen or damaged books. Yes. You are welcome to use a shipment method other than the free UPS shipping label, however please be aware you will need to do so at your own expense. Checks normally arrive within 2-3 weeks from the time we receive your package. The online buyback program is only intended for individual students attending this institution. The online buyback program is not intended for bulk used textbook dealers. Copyright © 2007 MBS Textbook Exchange, Inc. All rights reserved.